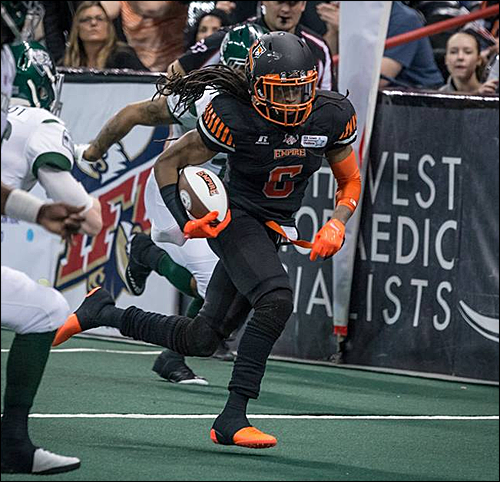 SPOKANE, WA – The Spokane Empire recorded several moves on the Transactions wire leading up to their Thursday night game against the Colorado Crush, activating one key member of their defense, releasing two players, and signing one player with ties to its past. Nearly a week after signing on with the New York Giants in a minicamp tryout, LB Nick Haag is returning to Spokane. The Empire officially activated him off of their Transfer List on Tuesday. With Pasquale Vacchio expected to miss a few weeks with a pectoral injury, Haag’s return helps an Empire defense that was one man down in last week’s loss to the Arizona Rattlers. With the Empire playing 4 DBs and only one linebacker, the defense was gashed up the middle by RB Darrell Monroe. The return of Haag will not only bring skill and replace Vacchio’s void, but his leadership and energy will be a welcome return. Through 10 games, Haag has tallied 53 total tackles, 4.0 sacks, 6 tackles for loss, 2 forced fumbles, 1 fumble recovery and 2 pass breakups. In a surprising move, Tuesday’s transactions showed that the Empire released veteran DB Robert Brown. Brown was arguably the Empire’s most talented member in their defensive backfield. According to sources, Brown was released in favor the younger defensive backs, such as Antoine Tharpe and Qua Cox. He led all Empire defensive players with 10 pass breakups and was tied for the team lead with 3 interceptions. He also recorded 52 total tackles (28 solo). Brown didn’t stay on the free agent market for long, as he was signed by the Nebraska Danger on Wednesday. The release of Brown is puzzling; not only did the Empire release a talented player and fan favorite, but that he was picked up by an Intense Conference foe that’s in the race for a playoff spot. Brown signing with Nebraska has a silver lining; he’ll finally get the chance to play on the same professional team with his twin brother, RB Rob Brown. 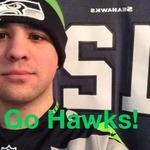 On Wednesday, Spokane signed kicker Brian “Bamma” Jackson to the active roster. The move is likely an emergency kicking transaction. Rookie Brendon Garcia, the team’s primary kicker, was not listed on the transaction wire. That could mean he's unavailable for Thursday’s game against the Crush. In addition to kicking for the Empire, Garcia is currently obtaining his Postgraduate Degree at Gonzaga University. Jackson, a native of Dothan, Alabama, is a name Spokane Shock fans should recognize from back in its days as members of arenafootball2. 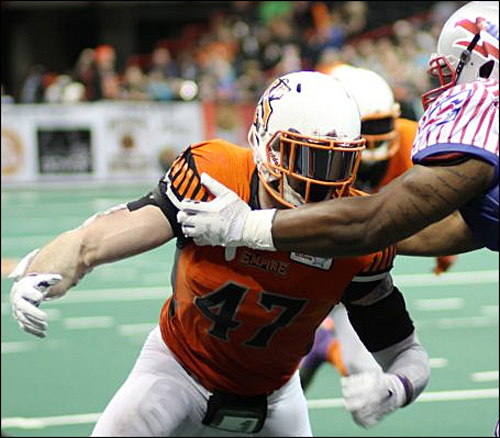 A longtime veteran in various levels of arena/indoor football, Jackson got his start as a member of the Shock in 2008 under Head Coach Adam Shackleford, and was part of the 2009 af2 ArenaCup Championship team. In his two seasons in Spokane, Jackson converted 14 of 24 field goals and 216 of 247 extra points and a total of 261 points. In 2010, after Spokane made the move from af2 to the AFL, Jackson signed with the Alabama Vipers. He converted 3 of 6 field goals and 78 of 85 extra points. In 2011, he played one game as an emergency kicker for the Georgia Force, converting 9 of 10 extra points. 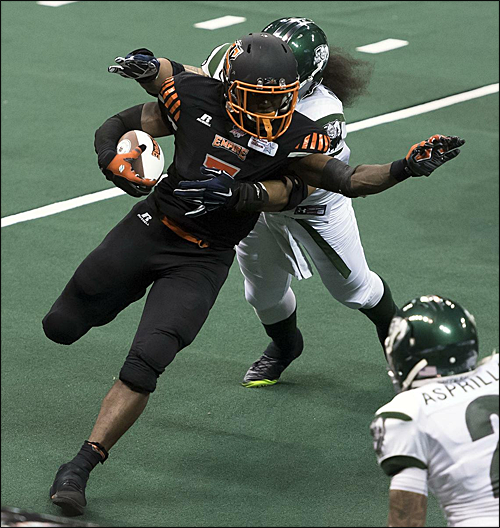 Jackson played for the PIFL’s Alabama Hammers in 2013. The Hammers would go on to win the PIFL Championship that season. That same year, he would play for Team America in the CDFL Euro-American Challenge, helping Team America defeat Team Europe 24-7. In 2014, Jackson was the emergency kicker for the AFL’s Orlando Predators, appearing in one game and converting 3 out of 3 extra points. Jackson would eventually re-unite with Shackleford in 2015, serving as the emergency kicker for the Tri-Cities Fever. He converted 3 of 3 field goals and 7 of 7 extra points. Later that same year, he played in 3 games for the AFL’s New Orleans VooDoo, converting 1 out of 1 field goal attempts and 13 of 16 extra points. In addition to the Empire’s transactions on Wednesday, the team released RB/KR Mulku Kalokoh. The move is likely clearing a roster space for kicker Brian Jackson. 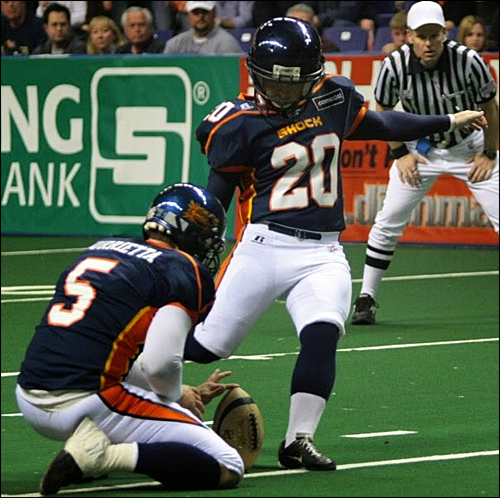 With more than 6 years of kicking experience, Jackson also fills the last available spot for “veteran players” allowed on an IFL Roster. Known as the “Sioux Falls Rule,” IFL teams are only allowed 7 players with 3 or more years of professional experience. Kalokoh appeared in 7 games with the Empire and rushed for 200 yards and 6 TDs. Just so you know, Jackson was not on the roster that I got from the IFL. Must not have happened in time. Spokane doesn't send out the rosters for Road Games, so unfortunately I don't get that information. I have to go by based on what I look up and who I'm associates with. I take it Garcia was listed? Jackson's own website states that he's been an emergency kicker since 2011, so I'd be very surprised if he were to be signed for the rest of the season.